Go ahead, reader; take a look at the calendar. Most likely you're now suffering from an overload of pink; yes, it's that month again, when the site theme goes all rosy and half the population snarfs down chocolate and reads old plot comics. I'm talking about Valentine's Day. What's that, you say? You don't have a Valentine? Thankfully, on Neopets, that sort of thing is totally taken out of the equation. Valentine's Day, here, is about pink, red, and chocolate. Chances are you're a fan of at least one of these things, so I've complied a list of the Top Ten Gifts That Give Back; because while giving may be better than receiving, no one minds getting a little bit for themselves as well. These gifts can either be given to another user, or to your pets themselves - lovely! Ah, yes, chocolate. The gift hardly anyone can refuse - except for picky pets who would literally rather eat a worm nugget than a doughnut. Yes, Luxor, I am talking about you. (crazy Peophin...) Also a sickeningly sweet cliche, but let's try not to cave to puns five lines in, right? What you get back is, if you're smart slash lucky and get one with the right rarity, you might get an avatar. HUZZAH. A good hint (for the guide shunners) is to buy items above 5k. The only thing better than food is a whole meal, and I'm pretty sure than even a skeptic can ignore the questions that arise from trying to eat ice cream in salt water when you're taking them to kelp. The service is awesome, the food is exceptional, and once more, if you're lucky and or full you might take home an avatar. Now, let's move on before I make a terrible aquatic pun. 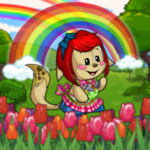 If your giftee (user or Neopet) is a kind, gentle and wonderful person, you can buy them a petpet and paint it for them; nothing says 'I care' like giving your Neopet something cute to hug and love for the five seconds it takes to drag everybody down to the Rainbow Puddle, splash on the pigment and ship away your newly pink'd petpet to your Neofriend. Well... it'll show your Neofriend you care. Since that last bit went swimmingly - late puns tend to sting, sorry about that - I'm going to be bold and offer something more.... fun to give. If your friend isn't much of a friend at all, simply catch that Meepit that's sitting outside your Neohome right now, plotting evil - it is there, I can promise you - and give it away. Thankfully, the Meepit is born pink, so no trips to the Puddle and no subjecting your pet to the horrors of caring for one, however brief. What's that, you say? You don't think you're getting much back from this gift list? Well, here you go. Yet another avatar granting gift, simply paint - or if you're lucky slash labbing, zap - a pet Pink, feed it some popcorn and another avvie. Boom. Plus, pink is a lovely color on most species... Perhaps not both genders but some boy pets don't mind being pink. Because nothing says 'You're important to me' like subjecting your favorite Bori or Aisha to upwards of months of very evil red electricity to morph them into something that very well might be consumed in a moment of distraction. I refuse to recycle old jokes - good for the environment as it may be - so I'll suggest you alternately go lurk on the Pound Boards and offer a pet of your own or a custom for a Chocolate. While you're out, better try and make a card for the Bank Skeith; he's got better things to do than shovel out your money every ten minutes. Your reward? Chatting with the nice folks down on the boards. ...What? They are gifts, first and foremost, and it's the thought that counts; so stop thinking about yourself. On the off chance your bank account hasn't been bled dry, make as well make it gush money now, as you shell out the NP for a likely dream come true. And if your friend does not like either a Krawk, a Draik or a UC - which could be traded for a Draik or Krawk - they will hopefully just return the gift and you can go back to the Boards and be swamped by those who'd love a custom. If your friend doesn't like the potion, tells you so, and keeps it anyway, congratulations! You can get yourself a new friend now, or at least go be buddies with the Soup Faerie. I'm not meaning this in the way of 'oh hey I need all your NP/NC pay ya back later.' I mean this in the way of 'hey, I can draw, you can write; let's work together on something sometime. I owe you a few hours of my time. ' Because time is priceless, something we can never get back. And if you're sitting here thinking, 'darn, I just wasted five minutes of my life reading this and it goes all cheesy like this', just take a moment to think about the people you wish you could spend more time with. Nothing can ever fix the past, but you still have the future. So go on- promise to spend some time with a friend soon. You'll enjoy it just as much as they do. Well, that wraps up my list; hopefully it at least helped get y'all in the holiday spirit. C: Well.... the Neopets holiday spirit. Cheers!